Sometimes Foodie: I'm Going to Otakon! I know my reviews have been pretty spotty this week, but along with this food blog, and my day job, I also make art and all kinds of accessories. Normally I'm able to juggle everything just fine, but I have a table in Otakon's Artist Alley this week and it's eating up all of my sanity free time. Otakon is a HUGE Anime & Japanese Culture-themed event with over 30,000 attendees, so I've been goingcrazy doing all kinds of things to prepare. I've actually been working on this for months, but since I leave tomorrow morning...it's crunch time, and Sometimes Foodie was put on the back burner. Since I'm not going to sleep (again) tonight, I'll be queuing up Japanese and Asian themed reviews to tide you over while I'm gone this weekend. 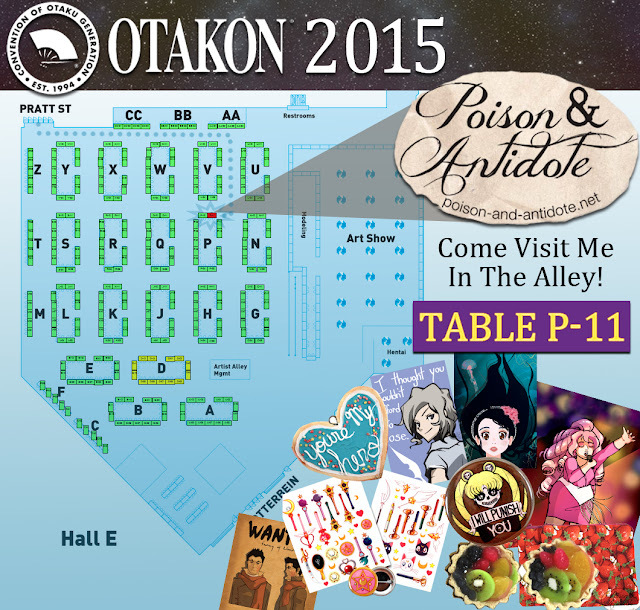 This year Otakon takes place during the 24th, 25th, & 26th of July. It’s a full weekend filled with panels, special guests, art and all kinds of events! If you’re going, be sure to stop by and visit me! I’ll have all kinds of art and I’ll be cosplaying!